Yes! It Is Possible To Have A Dream Wedding Regardless Of Your Budget! Since you were just a little girl, you’ve dreamed of your wedding day and fantasized about the celebration; the music, the dancing, and all your loved ones gathered to witness your commitment to your special partner. After a time-consuming effort of putting together a strict budget for your wedding expenses, you’ve realized that not only is it both tiring and frustrating, but the fantasy wedding you’ve had in mind seems extremely expensive. Even if you skimped on the flowers or eliminated some of the guests, you still come in way over budget. On paper, it looks as though you will have to start “getting practical” and “realistic” in order to stay within your budget, and ultimately give up on that dream wedding that you hoped for. A professional wedding planner can stretch your dollar as far as it can possibly go, regardless how minuscule your budget happens to be. But the problem that now comes into play is, hiring a wedding planner will also cost you money and add at least hundreds if not thousands to your overall expense. So, what is the solution? Well, you need all the knowledge and skill that a wedding planner has but without having to pay the cost, right? 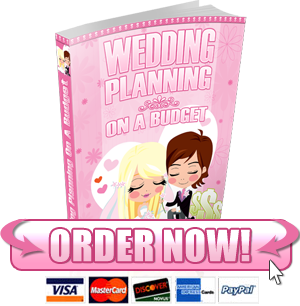 Well, now you have access to a guide that will allow you to plan your OWN wedding just as well as a skilled wedding planning professional with years of experience! How wedding planners deal with wedding vendors so they can get the deals that nobody else can! How to purchase your wedding attire at insane discounts, regardless of the size of your wedding party! These strategies alone could save you up to a couple thousand dollars that would be better spent on your honeymoon. How to choose the perfect location for your reception. What mistakes to avoid that could end up making your wedding day a disaster. How to save hundreds of dollars instantly on wedding invitations. You won’t believe how easy this one is. How to plan like a professional! A step by step blueprint on how to plan your wedding in a way that will get you crazy deals unavailable to just “any bride”. Don’t give up on the wedding features that you are looking forward to the most just because you’re unaware of how to get around the over-priced rates charged by wedding vendors. How do you think wedding planners do it? They don’t have special powers. You just need to plan the way they do…and isn’t it worth reading a guide that will share all their secrets? After all, it’s one of the most important days of your life and it should be celebrated that way! You will receive instant access to your download as soon as successful payment is made.